Something to Write Home About is a riveting collection of personal baseball memories told in handwritten letters to author and pop songwriter Seth Swirsky by the likes of President George W. Bush, Hall of Fame slugger Ernie Banks, Senator Edward Kennedy, Sir Paul McCartney, L.A. Dodgers all-star Shawn Green, Hall of Fame pitcher Tom Seaver, Meet the Press moderator Tim Russert, astronaut Buzz Aldrin, and many other well-known and passionate fans and players of the game. Jump inside this wonderfully original book and read these incredible stories, written by the people who were there as they happened. Filled with more than 170 rare photographs and amazing pieces of historic baseball memorabilia from the author’s own collection, Something to Write Home About truly has something for every lover of baseball’s unpredictable energy and drama. 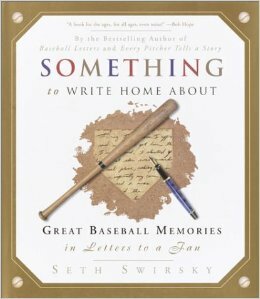 During the baseball strike of 1994, Seth Swirsky stayed in touch with the game by writing letters to baseball players young and old—the famous and the not-so-famous. Those letters were turned into his first two bestselling books, Baseball Letters (1996) and Every Pitcher Tells a Story (1999). Something to Write Home About, the third in this remarkable trilogy, confirms Swirsky’s status as baseball’s number one fan and aficionado. Visually stunning, historically compelling, and just plain fun, Something to Write Home About invites readers to come in, pull up a chair, and spend some time reading these amazing and revealing recollections about baseball and life.